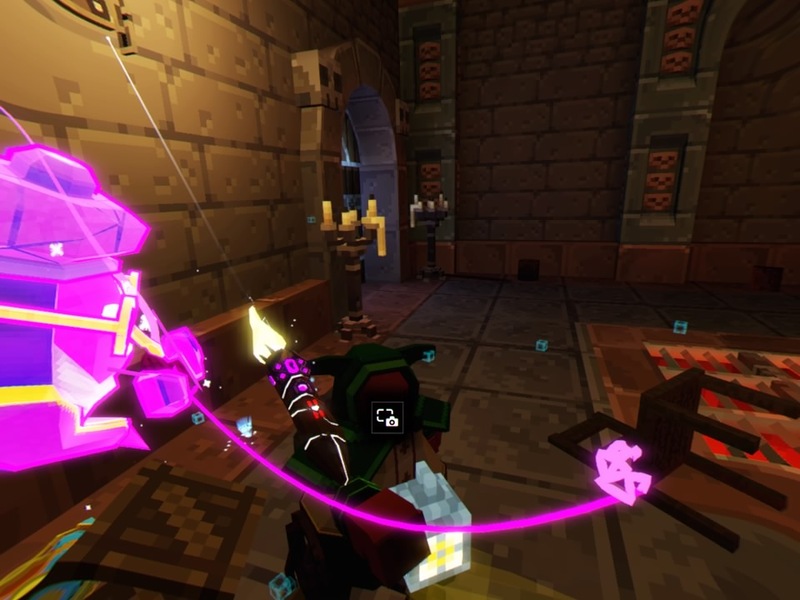 Smash Hit Plunder is the debut PS4 game from Cornish developers Triangular Pixels and is a VR-only title. It does require the use of at least one Move controller, but is better with both, and is out physically in North America and now on PSN in North America and Europe. Assigning a genre to this one is pretty trick as we’re not sure we’ve seen a game like this. The closest is another VR game, Catlateral Damage, which saw you playing as a cat pushing things off of shelves, and so I guess this is basically an arcade damage accumulation game (and as such is one of the two best games in that not-very-populated genre). The premise of the game is that you’ve inherited your family’s castle but before you can you paint everything in nice pastel colours and get your man cave on, you get magically sealed in by a ghostly debt collector. It turns out your family were deadbeats and owed a lot of money and you’re not getting your freedom back until you’ve paid off your grandma’s debts. This is where the main gameplay loop comes in. Each level is a small section of the castle, just a few rooms, and you have to go in and find as many coins as possible within a time limit. The number of coins you earn dictates how many crowns you earn (this is essentially the same as the usual three-star system you get on many games) and those crowns help unlock later levels. The castle rooms are littered with objects and you’ll find coins behind them or, more importantly, in them. 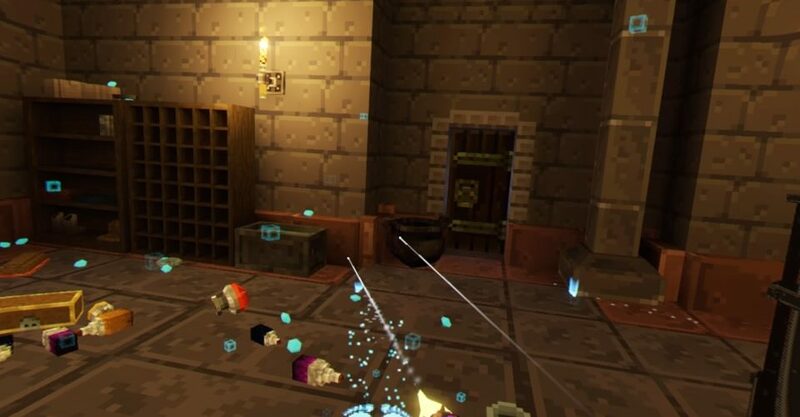 You can smash items by flinging them at walls and floors or even by picking up one in each hand and smashing them together. It’s initially pretty cathartic once you get your head around the controls. You’ll use the trigger to grab items and to throw them you just swing the Move controller as if you were actually throwing something and you just release the trigger to let go. 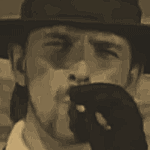 You then hoover up the loot with or (doesn’t matter which) on either Move controller. This allows you to multitask using either hand for destruction or collection and while it can seem a little awkward at first, like many Move-controlled games, it works quite well and is eventually pretty satisfying. The only other controls you need to worry about are for walking. To do this you just point the Move controller (either one) where you want to go and press the Move button. This will make your character walk there. Holding down the same button and ‘pulling’ the Move controller will rotate your view on the spot too. Moving and rotating works as well as can be expected but can feel a bit clunky and that becomes an issue because time is a real factor. What feels like a good run might only net you one crown and so to get two you really need to be efficient with your destruction. Getting all three takes some familiarity with the level, lots of multitasking and a bit of actual skill with the Moves. However, some three crown ratings seem nearly impossible and we aren’t quite sure what it will take as we’ve more or less cleaned out some of the early levels and aren’t sure what’s left to do there. On a base level, the smashy gameplay is actually quite good fun. It all feels suitably frantic and the VR viewpoint, along with the use of Move controllers, makes it reasonably cathartic. The fun depends a little bit on the levels though. Some are full of things to smash and plunder while other levels look like a minimalist’s apartment with everything tucked away. This leads to mixed levels of enjoyment but for the most part we had fun rampaging through the levels. It is a fairly limited experience though and does get a bit stale after a few stages and that’s the game’s main problem. Solo players can also take on the Treasure Hunt mode which puts you in the same levels but has you tasked with finding specific items. Again, this works reasonably well but isn’t a ton of fun and is more frustrating than fun and ends up being little more than a memory test. Both of these modes are available in two-player co-op too and this takes us onto Smash Hit Plunder‘s clever multiplayer options. To mix things up a little, there are two interesting asynchronous versus multiplayer options where one player has the headset and the other gets a top-down view on the main screen. 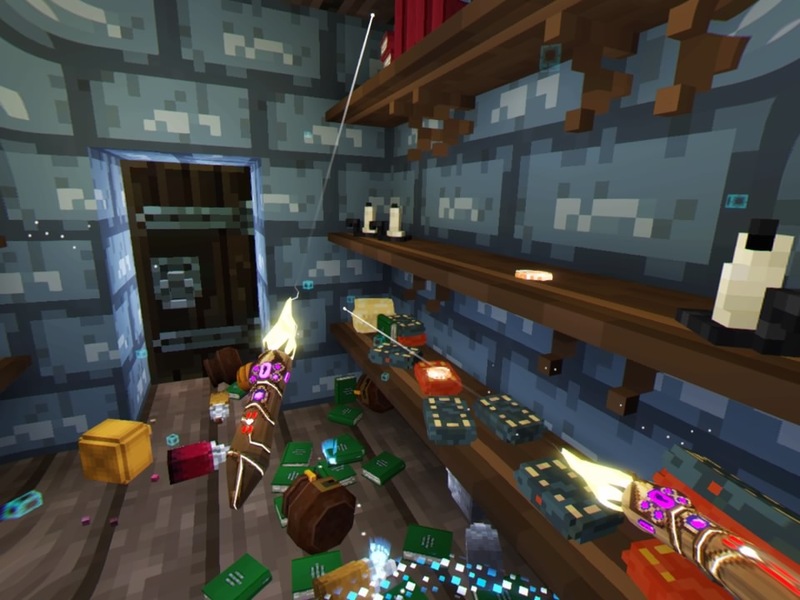 One has the VR player playing as a poltergeist with the TV player playing as a goblin, trying to track them down based on the destruction they are wreaking on the castle. The other mode has both players searching for a special object, hidden away, that needs to be taken to your ghostly granny in order to earn points. We applaud the effort to keep things interesting but the two modes weren’t much fun for either player. Especially the TV player who gets hit quite often, as in actually hit physically if you’re packed onto a sofa together. The versus modes actually support four players so that could be a real issue for some. 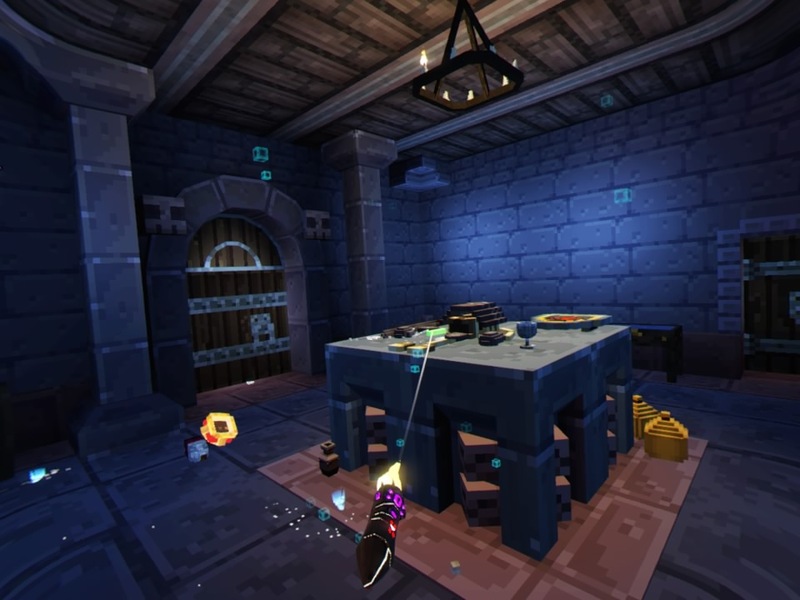 Triangular Pixels really have attempted to take the basic concept of finding and smashing things and add some depth but ultimately Smash Hit Plunder is a little too shallow and the presentation also lets the overall package down as it uses a basic Minecraft aesthetic which, when combined with the drab look of the castle itself, doesn’t really wow you in VR. We want to like the game more than we do but in small doses it is good fun but if you’re going to the hassle of putting on your PSVR headset, you’ll probably end up playing more impressive games from your collection before you dip back into this one. 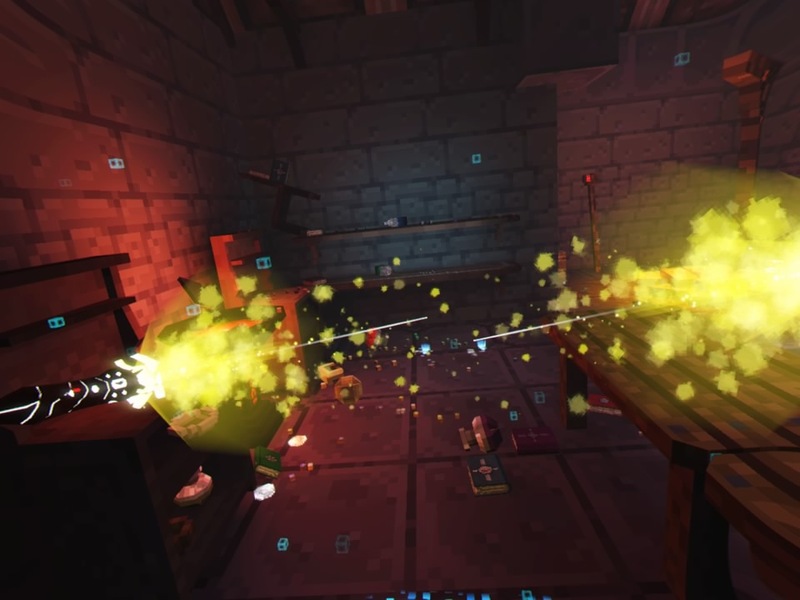 Smash Hit Plunder is an accessible looting game that sticks to one simple concept, which is smashing everything in sight. It works well for a while but fell a bit flat after repeated play sessions. The asynchronous multiplayer options are a nice addition but you might struggle to find players who want to play this more than once.